FULTON, NY – Oswego County Opportunities Deputy Executive Director Patrick Waite and Developmental Disabilities Individualized Residential Alternative Program Manager Renee Clarke present longevity awards to Developmental Disabilities Services Site Supervisor Danielle Yager and Residential Services Direct Support Professional Andrea Maksim, for 5 years for loyal service to OCO and its consumers. 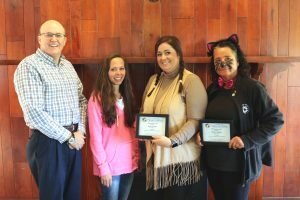 The awards were presented at a Halloween themed luncheon. For more information, visit www.oco.org.